Hazel and Gus are two teenagers who meet, become friends and then fall in love. The two share a common goal - a steadfast refusal to let cancer dominate and define their lives. I don’t remember how I ended up reading John Green’s bestselling novel, A Fault In Our Stars, but I do remember enjoying the sweet, yet heartbreaking story of Hazel (Grace) and Gus. As a result, I was interested in director Josh Boone’s cinematic adaptation - particularly when I realised that the impressive Shailene Woodley (who I just love in The Spectacular Now) was to play Hazel. 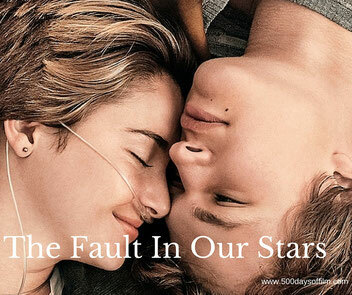 At the start of the movie, The Fault In Our Stars (TFIOS) seems determined not to sugar coat its “sad” story. The film aims to tell “the truth” about how Hazel and Gus’ life is impacted by cancer. However, while TFIOS is, often, refreshingly frank and, sometimes, tough to watch, it is also undeniably sweet - and not always in a good way. I enjoyed The Fault In Our Stars. Woodley and Elgort are charismatic, engaging leads and the tears I shed at the end of the film are testament to the fact that I cared about both characters. I also love any film that features Laura Dern - even if she doesn’t really have much to do here. The movie does make missteps - the kiss in Anne Frank’s house being the most significant. However, despite these flaws, I appreciated the fact that The Fault In Our Stars has interesting things to say about how cancer can define a person - particularly a young person. The film also shows how Hazel and Gus struggle with the knowledge that their illness also causes pain to the ones they love. They are, as Hazel explains, ticking time bombs with an almost unbearable responsibility to keep positive. While not perfect, The Fault In Our Stars is worth watching if you are in the mood for a sad story featuring two charming central performances. Have you seen The Fault In Our Stars? If so, what did you think of this movie? Let me know by leaving me a comment in the box below!